The Jacksons Lane theatre is home to lots of innovative circus work. 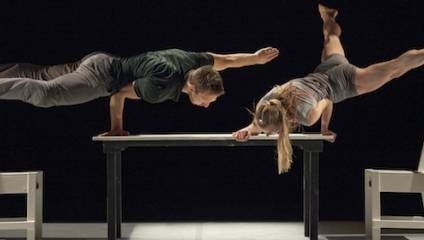 Don’t miss the chance to see Imbalance – the latest show from internationally renowned choreographer Jonathan Lunn. By thinking about the meaning of ‘balance’, this new show combines circus performance with dance to explore our strange relationship to technology. Imbalance is at Jacksons Lane on the 30 and 31 October. Tickets from £8. The 2017 World Press Photo Exhibition returns to Southbank Centre’s Royal Festival Hall for the 21st year from 3 – 20 November 2017. The free exhibition brings together 152 winning photographs from the annual World Press Photo Awards, showcasing some of the most powerful, emotional and often disturbing press images of the year. The annual photo contest rewards photographers for the best pictures contributing to the past year of visual journalism. 2017 World Press Photo Exhibition is at Southbank Centre’s Royal Festival Hall from Friday 3 – Monday 20 November 2017. Admission free. If you are missing the summer then this night at Egg London might be for you. Ibiza headliner Matthias Tanzmann returns to Egg London to ignite your Saturday with his characteristic high-energy house. He’ll also be joined by East End Dubs, a cockney DJ famed for his base heavy mixes. Completing the line-up is Egg London resident Kyle E, who after a busy summer line up treats Londoners to more of his banging tunes. You’ll be dancing all night. The film festival returns, showing the best Korean cinema has to offer. This year, their special focus is on Korean Noir, showing 13 films in the dark genre. They are also offering masterclasses with Director Lee Doo-yong and Cinematographer Kim Hyungkoo (The Day After). The festival happens across London in various venues including Picturehouse Central, Regent Street Cinema and the ICA. Don’t miss out on this amazing chance to delve into some of the most challenging and gorgeous cinema happening right now. London Korean Film Festival 2017 runs across venues in London, from 29 October to 19 November. If our write up about the Top 5 cheese restaurants in London hasn’t given you enough cheesy ideas, then The London Cheese Project are hosting a weekend of all things cheese at the Geffrye Museum. The festival aims to showcase new generations of cheese lovers, producers, and makers as well as hosting lots of delicious street food. They also offer cheese making workshops and demonstrations. The London Cheese Project is on Saturday 4 and Sunday 5 November at the Geffrye Museum. 11am – 8pm. Tickets are £4.